On the tenth anniversary of the Chernobyl disaster, I was standing at a public meeting in Kiev, Ukraine, listening to the story of one of the firemen deployed to clean up the site after the explosion. These workers took huge doses of radiation during this task, and their story is a terrifying one. About 600,000 men were conscripted as Chernobyl `liquidators' [also called bio-robots']: farmers, factory workers, miners, and soldiers -- as well as professionals like the firemen -- from all across Russia. Some of these men lifted pieces of radioactive metal with their bare hands. They had to fight more than 300 fires created by the chunks of burning material spewed off by the inferno. They buried trucks, fire engines, cars and all sorts of personal belongings. They felled a forest and completely buried it, removed topsoil, bulldozed houses and filled all available clay-lined trenches with radioactive debris. The minimum conscription time was 180 days, but many stayed for a year. Some were threatened with severe punishment to their families if they failed to stay and do their duty. These `liquidators' are now discarded and forgotten, many vainly trying to establish that the ill health most have suffered ever since 1986 is a result of their massive exposure to radiation. Nuclear dumps & reactors explode all over. Las Vegas is no exception ...take Beatty, NV - 100 miles from Las Vegas. Feel lucky? ...radiation is accumulative – Gamble your life & family's future? Las Vegas & Tokyo Olympic winners: Feel lucky? Why not go to Las Vegas & gamble with your life & unborn child? – all your eggs are present from birth – radiation is accumulative forever ... or, attend Tokyo 2020 Olympics (plutonium) hot spots & eat, drink, sleep, spectate & compete in plutonium hot particles for 100,000 years - get a medal for tumors, lesions, heart attacks, strokes & excruciating pain as a free bonus. We have a catalog of products to show you that you may buy from the companies that make them ... we do not get involved in the transactions in any way, other than reviewing products for you and referring you to the companies. In the event of a nuclear emergency, the FDA deems infants and children, as well as pregnant and nursing women, at the highest risk for radioiodine-induced thyroid cancer. For children who are able to swallow tablets, the KI tablets still have to be cut to achieve the proper dose for their age and weight. 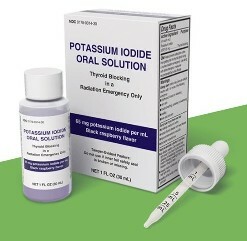 Ready-to-use Liquid KI Oral Solution provides a simple way to immediately and precisely dose potassium iodide when advised due to a nuclear emergency according to FDA-approved dosing. This is the ultimate reusable face mask for comfort and durability. The advanced silicone material provides a softer feel on the face with a unique adjustment design that helps to reduce the tension and pressure points for unsurpassed comfort. The Cool Flow™ exhalation valve design helps make breathing easier and helps reduce heat and moisture build-up in the facepiece. 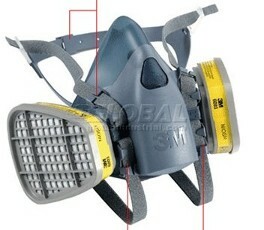 Uniquely designed dual mode head harness adjusts easily allowing the user to wear the respirator in either traditional or drop-down mode. The Inspector Alert™ Handheld Nuclear Radiation Monitor improves safety in laboratories and in the field through quick analysis and determination of radiation levels. 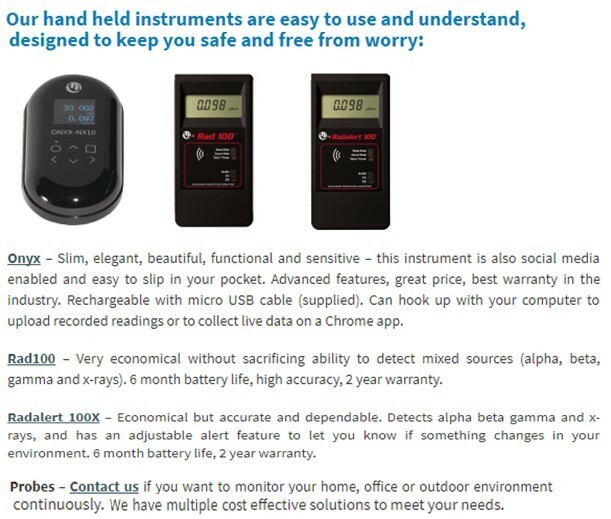 The handheld monitor measures alpha, beta, gamma and x-radiation. Its safety-first calibration feature can eliminate exposure for personnel. 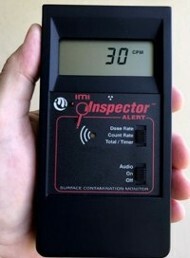 The Inspector Alert quickly notifies first responders to the presence of harmful levels of nuclear radiation. Easy to read digital display shows a wide variety of readings: mR/hr, CPM, CPS, or µSv/hr. Your first response is disbelief. 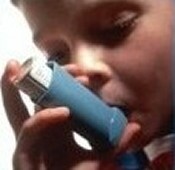 Your second is three-part: (A) fan down your terror, (B) wear an air filter mask to prevent lung cancer; and, [C] having previously consulted with your doctor what to do in such an emergency, take potassium iodine to prevent thyroid cancer as recommended by your doctor, and as recommended, here. 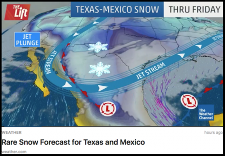 Shelter in place - or - get out of town. 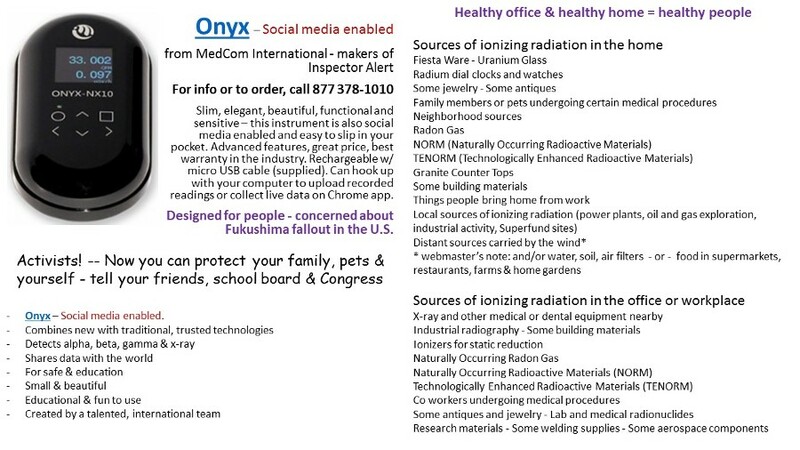 Take your radiological emergency response kit, guns, gold, family, friends & pets away. Arrest, try & permanently imprison Congress as accomplices for letting the nuclear industry and central banks get away with murder. Cut the military budget in half, use that money to install solar power overnight; withdraw all our troops from around the world currently fighting to protect central bank oil interests and the petrodollar, use our troops and NATO and U.N. troops to install solar power in the U.S. and around the world within 24 months; and install pre-packaged sewage pasteurization facilities, bathrooms and plumbing and clean water where ever it is needed on a global basis. Divide all the money in the world up equally. Convert from a money standard to a love standard. Make a list of every corporation harming Mother Earth, and shut them down overnight. Give minimum yearly incomes, transportation, healthcare and firearms training to, and arm every qualified adult in the world. Revamp the education system so that children are trained to be doctors, lawyers, plumbers, mechanics, electricians etc. by the time they finish elementary school and high school.